This isn’t a proper review, just a list of things I noticed / liked / disliked about the Salinas Valley California family saga East of Eden by John Steinbeck. The book started out like books written in the middle of last century do—slowly, with lots of description. But I didn’t mind as it was all grand, large-stroke painting. Though I do remember thinking, somewhere around page 50, I wonder when he’ll have all the furniture in place. At the beginning I was confused over who was who. Steinbeck embarks on telling several family histories which, at the start, have no connection with each other. A family tree or a who’s who section would have helped. There are some pretty dark characters. Kate / Cathy is incredibly evil and though her activities are mostly only hinted at, there was a point at which I wondered if I should / wanted to read on. I persevered and I’m glad I did. 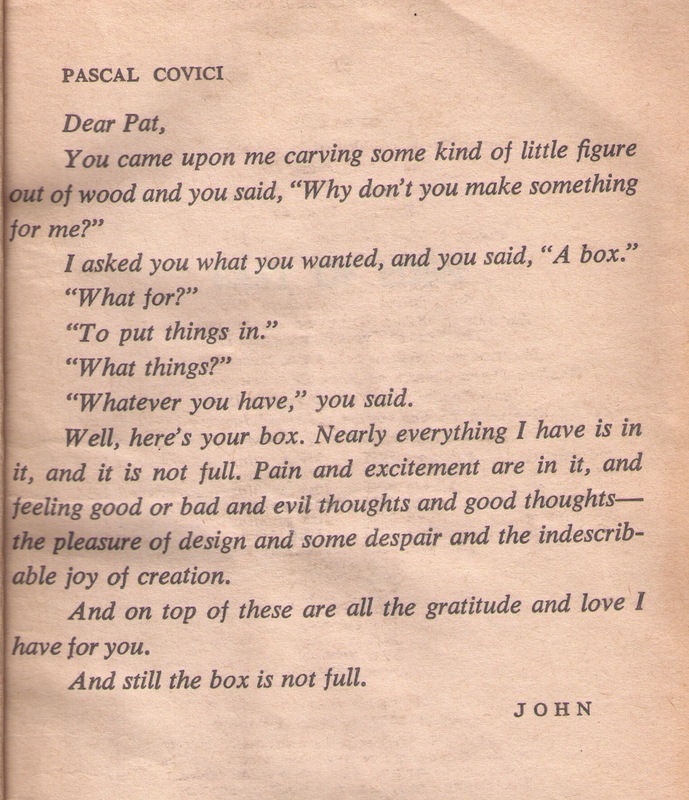 I really enjoyed the way Steinbeck explored the theme of good and evil, whether we’re born pre-determined to be evil (with evil genes, so to speak) or whether we have choice. He riffed on the bad-brother, good-brother archetypes Cain and Abel, creating two sets of C&A brothers (Charles and Adam Trask; later Adam begets twins Caleb and Aron). “She had a dour Presbyterian mind and a code of morals that pinned down and beat the brains out of nearly everything that was pleasant to do” – p. 7 (1962, or thereabouts, edition). However, by the end of the book she comes across as Samuel’s anchor, his true north. Steinbeck’s softening portrayal of her sheds a much more serious and sympathetic light on the faith aspect of the book than I expected when I read the beginning. “’This one has been scraped and gnawed at,’ he said. ‘I wonder what agonies have settled here. Give me a used Bible and I will, I think, be able to tell you about a man by the places they are edged with the dirt of seeking fingers. Liza wears a Bible down evenly’” p. 237. “I believe that there is one story in the world, and only one that has frightened and inspired us, so that we live in a Pearl White serial of continuing thought and wonder. Humans are caught … in a net of good and evil. I think this is the only story we have and that it occurs on all levels of feeling and intelligence …. There is no other story. A man, after he has brushed off the dust and chips of his life, will have only the hard clean questions: Was it good or was it evil? Have I done well—or ill?” p. 366. 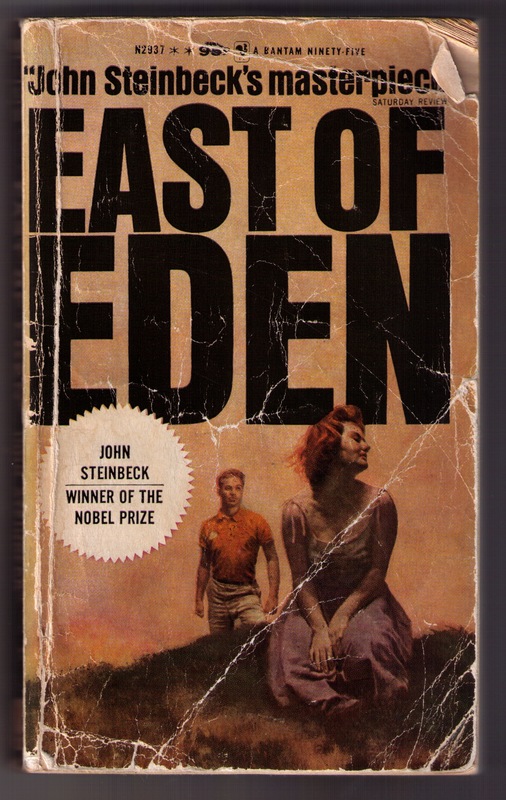 If you want to know more about East of Eden’s plot and characters, check the East of Eden entry in Wikipedia. Oh, and here’s a gem from the yellowed old book I read. It’s in the forematter, on the right-hand page facing the copyright and printing editions information. Thanks B., my son, for pressing me to read this grand classic novel!